Want to find out more about why we do what we do? Our Manifesto explains our aims and objectives, and highlights the wide range of projects and programmes that SoCo delivers. Read it here. In June 2017 we filled a city centre park with music and arts, showcasing talent and highlighting the benefits of creativity on wellbeing. Read the Umbrella Arts Festival report here. In 2014 SoCo embarked on an 18 project to turn an end of life government courthouse building into a vibrant community arts space. Read the report here. From 2010 to 2015 SoCo delivered a programme of creative adult learning funded through Southampton City Council and European Social Fund. View the evaluation report here. An evidence review of music making relevant to SEN/D settings resulted in this Evidence Bank. Download here. 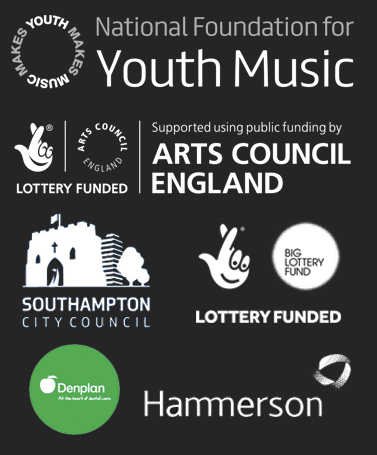 SoCo is one of 10 organisations nationally working with Youth Music on their Exchanging Notes progamme, a 4 year study into informal music making for at-risk young people. Read our year one report here. Supporting schools in Southampton and Eastleigh, we carried out an audit of music opportunities and facilities in secondary mainstream settings. Read the survey results here. Supporting SEN/D schools in Hampshire, we carried out an audit of music opportunities and facilities in primary and secondary special school settings. Read the survey results here. Sonic Explorers was SoCo Music Project’s music programme for young people in challenging circumstances. This has seen us deliver weekly music-making sessions at Toynbee School HiVis Club (an after school music club for students with visual impairments), Cedar School (a school for young people with complex physical, health and learning difficulties) and Polygon School (a school for boys with complex emotional and behavioural needs. Download evaluation. Funded by the Children and Adolescent Mental Health Service (CAMHS) in Southampton, our programme at Springwell and Cedar Schools in Southampton has seen us deliver a series of weekly one-to-one and group music-making sessions during school time, but out of main curriculum delivery. Read the report here. In 2015/16 SoCo Ran a number of free music clubs at The Courthouse, they were supported by Youth Music and included Afrobeat, music tech and songwriting. Read the report here. SoCo Music Project was awarded funding through Southampton City Council’s Community Chest Grant in 2017 to provide creative opportunities for vulnerable adult groups. This has seen us deliver weekly music-making sessions for adults with physical and/or learning disabilities in partnership with local day service groups. Read the report here.